Transparency is widely seen as an effective tool against public sector corruption because it curbs illicit transactions by exposing them to the public. In other words, transparency is a precondition for accountability. But, so far there is relatively scant empirical evidence to confirm this. Existing research seems to suggest that publishing data, even in vast quantity and great quality, is not enough to fight corruption in public procurement. One explanation for this is that insufficient attention is paid to the intended users and potential applications of the information published. In our study, we took a more in-depth look at public procurement data to identify the circumstances under which publicly available information helps to reduce corruption risks. We used more than 3.5 million government contracts across Europe, published between 2006-2015 on Tenders Electronic Daily to investigate differently defined transparency indicators and their effect on single bidding in competitive markets – a widely used proxy of corruption risks in public procurement. We assumed that the time of the data publication is crucial: information can be used in very different ways before and after a contract is awarded. Transparency before a contract is awarded (what we call ‘ex-ante transparency’) implies that all information needed to propose a winning bid is released in the call for tenders and that the criteria for deciding the winner are clearly stated; whereas transparency after award (or ‘ex-post transparency’) implies that information about the outcome of the process is communicated to the wider public. The +1 element refers to the publication of the actual call for tenders. If it is not published, the other five elements are automatically missing, providing a very strong signal of weak transparency. For comparison purposes, we also calculated a general transparency index, which is simply an aggregate of the two other indices. In our statistical models, we analyzed the effect of the before, after and general transparency indices on single bidding. Corruption risks drop noticeably as overall tender transparency increases: one additional information item published decreases single bidding by 0.4-0.7 % points. Publishing information in the call for tenders has a significant effect on corruption risks while releasing it after a contract is awarded does not. This suggests that internal transparency – information predominantly directed at insiders of the bidding process – is needed most for broader public accountability to emerge. A decrease of about 0.4-0.7% in single bidding might not sound like much, but single bidder contracts are on average 7.1% more expensive than contracts with two or more bidders, so the associated annual price savings across Europe are substantial. As a rough calculation, if transparency is increased by five items on average across Europe (out of 10 items considered), single bidding would drop by 2-3.5 % points. This means procurement tendering would be 0.14-0.25% cheaper on average, equivalent to savings of about €3.6-6.3 billion per year across the EU. There was another interesting finding: transparency has a much greater influence on single bidding in some countries than others. One possible reason for this is the diverse social context and the different level of citizens’ demand for accountability. We tried to capture these differences by looking at how voters respond to corruption and transparency, using European Quality of Government survey data. Specifically, we asked respondents what they would do if their preferred party was involved in a grand corruption case: vote for another party (i.e. punish the party for its deeds), still vote for the party (i.e., stay loyal despite the corruption case), or not vote at all (i.e., exit the situation completely). We found that in regions where people chose ‘vote for another party’ more often, transparency in the call for tenders had a significantly stronger influence on a decline in single bidding. Where people’s demand for accountability is greater, the positive impacts of transparency are more visible. 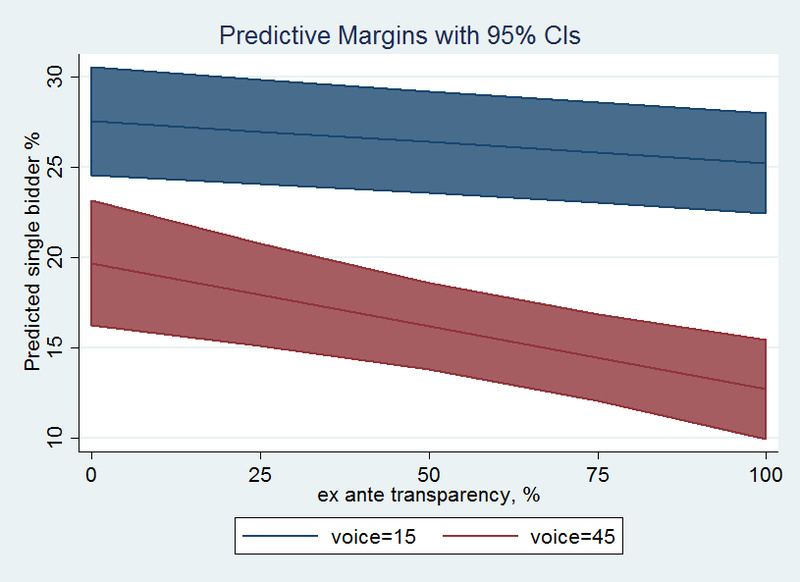 The predicted effect of ex-ante transparency (before award) on the share of single bidding in public procurement interacted with voice %, local buyers. We have shown that transparency in public procurement can act as an antidote to corruption. However, the type of transparency and the intended stakeholder acting on it play a crucial role. Transparency that helps insiders who have knowledge and resources to mobilize appears to be a lot more effective as an anticorruption tool than transparency intended to inform the wider public. In addition, anticorruption coalitions between public procurement insiders, predominantly bidding firms, and responsive voters, who are willing to ditch their preferred party when it gets implicated in corruption, appear to work most effectively in fighting corruption with the help of transparency. Policymakers who can enforce transparency rules for fostering anticorruption may use our findings to concentrate their efforts on information content, actors, and environments where greatest impact is expected.